Determining the truth - 2: Faith in senior devotees? On the need for a "living guru" all the senior-most devotees agree, even if they may disagree on other points. Hence, how can so many advanced Vaisnavas on the planet be wrong? How is it possible for such Krishna conscious persons, who have been strictly chanting Hare Krishna, to be hopelessly deluded as the IRM claim? We will examine this reasoning here. "Why this Gaudiya Matha failed? Because they tried to become more than guru. [...] But these people, just after his passing away they began to fight, who shall be acarya. That is the failure. They never thought, ‘Why Guru Maharaja gave us instruction so many things, why he did not say that this man should be acarya?' They wanted to create artificially somebody acarya and everything failed. [...] And as soon as he learns the Guru Maharaja is dead, ‘Now I am so advanced that I can kill my guru and I become guru.' Then he's finished." So this is clear evidence that, regardless of how long one appears to have been practising Krishna consciousness, when the desire to take the position of guru enters - "Then he's finished". And this was not just one or two individuals, but the entire leadership, the senior-most men. 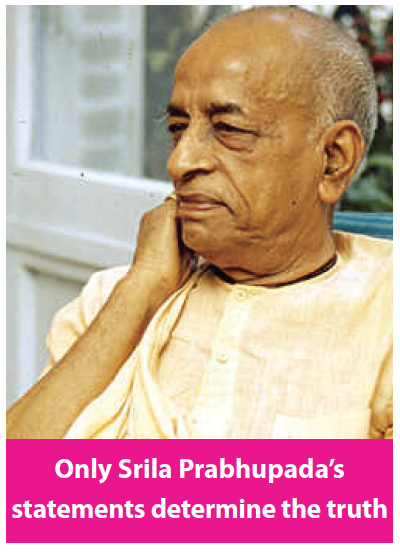 "by the influence of maya, illusion, a different idea soon evolved that Srila Prabhupada had appointed eleven "pure devotees" to serve as the only gurus after him [...] This zonal guru system, as it came to be called, prevailed in ISKCON for about ten years, until its falseness became clear"
It should not be surprising that exactly the same "senior" devotees who authorised and supported this false system are making similar arguments to support the guru system in place in ISKCON today. And it should also not be surprising that they are just as wrong again! Satsvarupa: "In our ISKCON, one becomes a brahmana after a year. It's not very hard. Everyone becomes a brahmana." Prabhupada: "That is due to chanting. That lift very easily." Hari-sauri: "Where will we introduce the varnasrama system, then?" Prabhupada: "In our society, amongst our members." Hari-sauri: "But then if everybody's being raised to the brahminical platform..."
Prabhupada: "Not everybody. Why you are misunderstanding? Varnasrama, not everybody brahmana." Hari-sauri: "No, but in our society practically everyone is being raised to that platform. So then one might ask what is..."
Prabhupada: "That is... Everybody is being raised, but they're falling down." "First offense is guror avajna, defying the authority of guru. This is the first offense. So one who is offensive, how he can make advance in chanting? He cannot make. Then everything is finished in the beginning. Guror avajna. Everything is there. If one is disobeying the spiritual master, he cannot remain in the pure status of life. He cannot be siksa-guru or anything else. He is finished, immediately. [...] The first offense is to disobey the orders of guru. That is first offense. So if you are offensive, how you can become advanced by chanting? That is also not possible." a) Consulting tradition, previous acaryas or the "testimony" of devotees. b) Examining the bodily status of the person presenting the truth. c) Examining the "seniority" of the person presenting the truth and so on. And when we do examine Srila Prabhupada's orders, ISKCON is seen to be hopelessly deviating in every major area, as documented in "ISKCON's new mission", BTP 30, and even agreed on by ISKCON guru HH Bhakti Vikash Swami, as documented in the last issue. It is no wonder, therefore, that ISKCON's leadership undertakes so many methods to determine Srila Prabhupada's orders other than actually examining Srila Prabhupada's orders!